Part 71: Elijah. As was mentioned in the last devotion, not all of the people in Israel were disobedient to the LORD. As we know, this is true of any nation or kingdom. Just because the leaders are wicked and evil, does not mean that all of the people they rule are evil. Certainly, many followed the example of their leaders, which is always the case; however, there were some who stood up to them and held them accountable in the name of the living God. Elijah was the greatest among the people who stood up to King Ahab and Queen Jezebel. So great was he, that he became known as the prototype for the one who would pave the way for the coming of the Messiah. For Christians, of course, the precursor to the Messiah was an obscure prophet named John the Baptist. The Baptist dressed like Elijah, ate like Elijah, and lived like Elijah out in the barren wilderness. What’s more, like Elijah, he stood up to King Herod calling all of Judea, and its leaders, to repent and turn back to God. But before we talk about John the Baptist, who will come much later in this series, we should first look at Elijah, the prophet who taught the wicked king and queen of Israel what it meant to bow in fear before the LORD God almighty. Elijah, also called Elias, means “My God is YHWH (pronounced Yahweh)”. YHWH is the name given to the Hebrew God of Israel; however, it is also a title and is often translated as LORD in English. Thus, Elijah means “My God is YHWH” or “My God is LORD”. Either way, Elijah’s name was fitting for the prophet who bore it, for he worshiped YHWH as LORD and stood against the cultic Baal religion of the northern Kingdom of Israel. At one point, Elijah being the only remaining prophet of YHWH still alive (the others were slaughtered by Ahab and Jezebel), the great prophet stood in opposition to 450 of Ahab and Jezebel’s prophets of Baal on the top of Mt. Carmel. In what could only be described as Hollywood EPIC, Elijah taunted the prophets and dared them to call upon Baal to accept their offering and save them. When nothing happened despite their efforts, Elijah called upon the LORD, who sent fire from the heavens to consume his altar saturated with water. Nothing was left. Following that Elijah directed the crowds witnessing the event to capture and slaughter all 450 of those prophets. Elijah was known for that epic battle, as well as for resurrecting from the dead the son of the widow from Zarephath through the power of God, and for many other miraculous deeds; however, even still, he was afraid for his own life and often found himself fleeing out into the wilderness in fear that the king and queen would have him killed. In one such scene, God asks him why he is hiding on Mount Horeb and then sends fire, and wind, and earthquakes and other things, yet Elijah could not find God in such things. Finally, Elijah discovers God in a still, quiet voice that called out to him like a gentle breeze. Here was God’s greatest prophet to date, who had stood alone against 450 maniacal prophets of Baal, and he still didn’t know the stillness and the peace of God. He was looking for God in fire, and power, and in the forces that shake the world; however, in this moment, God was showing that God was none of those things. God was a soft, gentle, whispering breeze of a voice and God was PRESENT there with Elijah in his fear and trembling. It’s as if God was telling Elijah, “Be still and know that I am God” (Psalm 46:10). How many of us are like this? How many of us look for God in all the wrong places and, when we don’t find God there, how many of us get caught up in fear and trembling, thinking that we are alone? Hear God’s voice calling out to you in the gentle breeze, “My child, be still and know that I am God.” Feel the spirit, the breath of God breeze by you softly, filling you with a peace that passes all understanding. Your God IS LORD and the LORD is with you! Lord, fill my heart, my soul, and my mind with your presence so that, in you, I may hear your still, quiet voice. Amen. My friend and I were traveling back home after a long and terrible weekend. Our rabbi, our Lord, had been crucified like a common thief. What a sad and terrible event. What were we to do now that he was gone? Everything he taught, everything he called us to do, seemed to all be in vain. While traveling we ran into a person who happened to be traveling alone and wanted to join us for some company. We certainly were in no mood for conversation, but it seemed harmless to let him join us. We said very little, for what could really be said? After sometime, the man broke the silence by asking us why we looked so down in the dumps. We told him the whole story. He told us we were foolish for being upset that the one we believed to be the Messiah had died. How could he say that? He then started giving us his interpretation of the Scriptures, about how the Messiah would be the suffering servant and that the prophets foretold that this would happen. We were amazed at this man’s confidence that all was well despite the circumstances. As we approached our home we invited him in to share dinner with us. It was the least we could do and we were interested to hear more of what this stranger had to say. He was going to keep going, but after insisting he agreed to stay. We gave him the honors of blessing the food and breaking the bread. 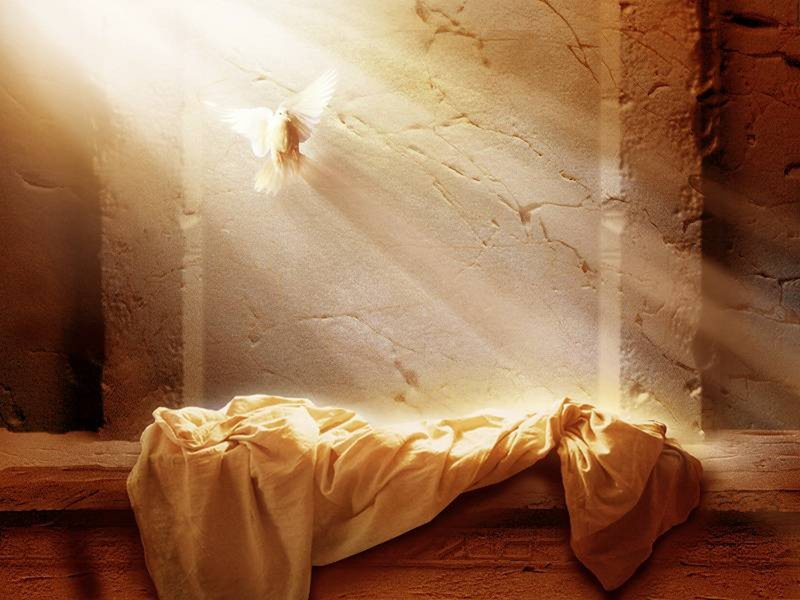 It was then that we realized who this man was…he was our Lord…he was Jesus the Christ…risen from the dead! Often times we are looking for the Lord to manifest in miraculous ways. We are looking for the clouds to open and to see the Son of Man descending like God from the sky. We are looking for the earth to shake and lightning to flash across the sky. We are looking for a major, earth shattering event! Yet, as can be seen in the various accounts of the resurrection, each person experienced Jesus’ resurrection in different ways. In Luke, the men traveling to Emmaus saw Jesus in a stranger passing by. They carried conversations with him, talked with him, listened to him and DID NOT recognize him. Yet, through the act of breaking bread together, they realized who he was. Reflect on all of the times you have felt the presence of the risen Lord. Perhaps you were lonely and someone was present for you in just the right time…or perhaps you were afraid only to find that the fear had been lifted. Perhaps you were helping someone out only to find out you were the one who was helped. Remember that Elijah did not see God in the fire, or the in the earthquake, or in the raging wind…rather, it was in the sound of a gentle whisper (or the sound of sheer silence as the NRSV translates it) that God’s presence was known. This Easter, open your heart to the subtlety of the Resurrection and be transformed by it. Know that Christ is with you always, and where you go…so too Christ follows. Perhaps in you, the risen Lord will be revealed to someone else. Lord, be present in me, through me and in spite of me for the transformation of this world. Amen.